Properly inspired by the millennia-old tales, and already immersed in the local culture, I easily made up a dragon playing with his “fortune pearl” out of the map of Kowloon Peninsula and Hong Kong Island. Of course, first I learned that the Cantonese two-word Kowloon translates as “nine dragons.” According to an ancient legend, a young emperor admired the eight hills of his land and associated them with mighty dragons. As an emperor, he was comparable to/descended from a dragon, and therefore there were nine dragons in his kingdom. Kowloon is a small yet beautiful and densely populated territory, facing Hong Kong’s iconic skyline from across Victoria Harbour. Due to constant land reclamation and new construction on the Hong Kong side, the harbor becomes narrower, and the mirrored skyscrapers of international brands move closer to Kowloon’s Salisbury Road, Tsim Sha Tsui Promenade, Public Pier, and Avenue of Stars, the newest addition to the southernmost tip of the peninsula. Dedicated to the movie stars and filmmakers of Asia, and graced with bronze statues, red granite star outlines, and tropical plants, the Avenue that runs along the waterfront, is the best place to watch A Symphony of Lights, the world’s largest permanent light and music show that plays out on the walls and rooftops of more than 40 of the tallest buildings on both sides of the harbor. 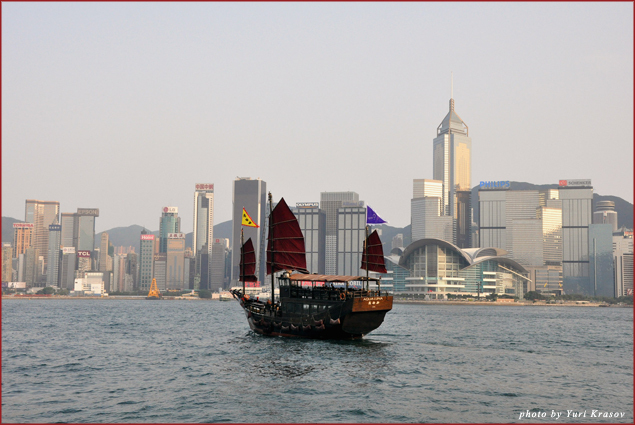 It starts on the roof of Hong Kong Academy of Performing Arts, moves to the Bank of China Tower and Cheung Kong Center. 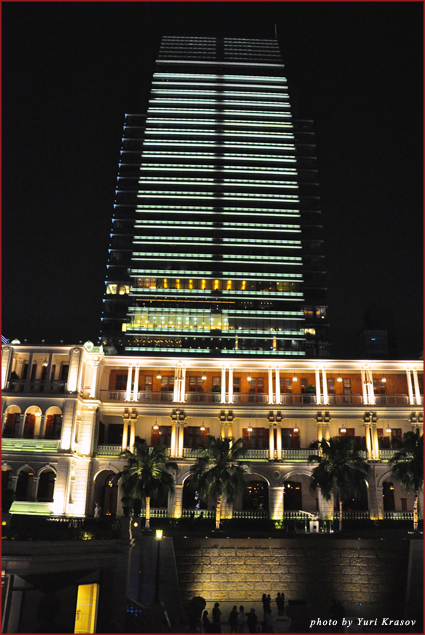 Then Central Plaza and Two IFC buildings start glowing with changing LED colors, from top to bottom. Then HSBC building, Far East Finance Centre, World Trade Centre, Police Headquarters and all the rest of the identifiable landmarks get their share of laser beams that cut through the thickening darkness. One evening, I was lucky to observe the show from a cozy banquette by the window of my room at InterContinental Hong Kong located on the most prestigious piece of land right behind the Avenue of Stars. The hotel, built in 1980, reflects a strong belief in feng shui tradition. Every morning, nine dragons descend from the mountains to drink water from Victoria Harbour. It’s considered bad luck to block their way, so the InterContinental that sits right by the sea, has floor-to-ceiling glass walls on both sides to let the dragons (and the sunlight) through. Since dragons usually carry pearls of fortune in their mouths, the hotel reception area is built in a form of a receptacle, allowing the magical beasts to drop their “money” here before they proceed to take a sip from the harbor. This beautiful legend doesn’t specify if the dragons ever stop in the Lobby Lounge for a popular Sunday champagne brunch or a sophisticated afternoon tea. I wouldn’t be surprised if they did. During my short stay at InterContinental on the way back from Singapore (so happy I decided to extend my Hong Kong stopover!) I had to force myself to leave the exceedingly accommodating premises whenever I ventured outside to explore the city. Between five designer restaurants; a spa with an open-air three-temperature infinity pool, almost overflowing into the harbor; spacious room with a stunning view; and Club InterContinental membership that included daily Moet & Chandon, it would be the easiest thing in the world to toss my maps and guidebooks with planned and circled city sights, and just stay in until it would be time to board my flight home. 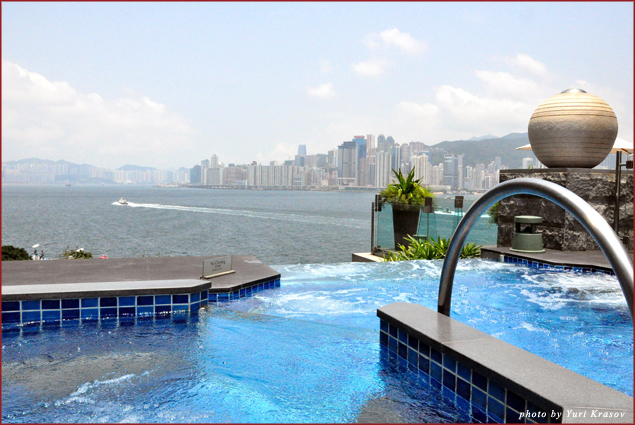 Consider lunch at Michelin-starred Yan Toh Heen, which translates as “the place to enjoy the beautiful view.” The never-tiresome harbor view was not the only thing to enjoy in the antiques-decorated restaurant. Place settings and table utensils at Yan Toh Heen are made of hand-carved green jade and cost thousands of HK dollars, so feeling like an empress just by being served here comes naturally. 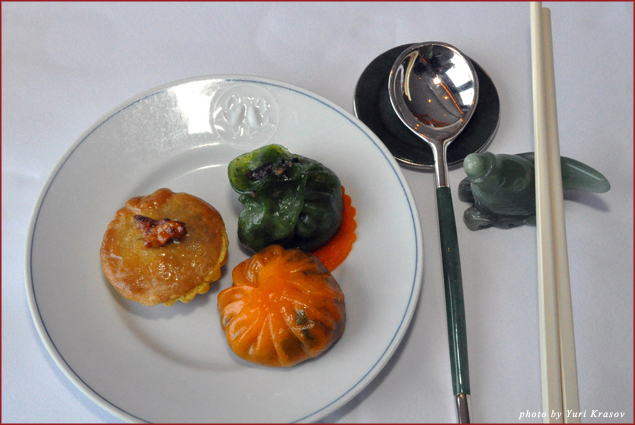 Chef Lau Yiu Fai’s special take on traditional dim sum – Hong Kong’s precious contribution to the world culture, if you ask me – shined in bright-orange carrot dumplings with chives; puff pastry with chicken filling, and spinach dumplings with crabmeat, topped with black truffles. The restaurant’s signature dish, deep-fried pear and scallop, presented an unusual and enticing combination of tastes and textures. Then steamed grouper arrived in a clay pot with lily root, green apple, and chives – yet another winning combination of delicate Cantonese flavors. Other outstanding dining establishments within the glass walls of InterContinental include upscale Spoon by celebrity chef/restaurateur Alain Ducasse, and casual NOBU, serving revolutionized Japanese cuisine. 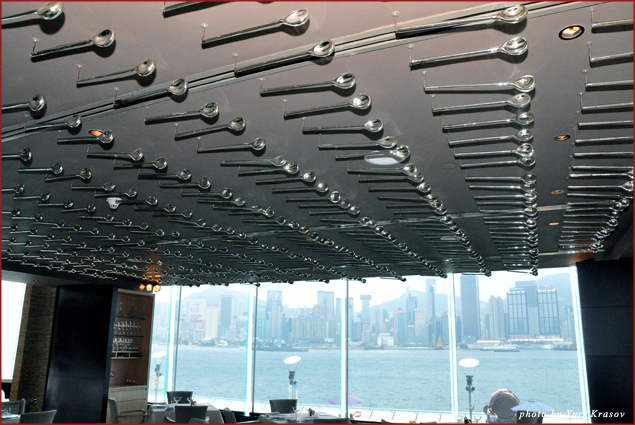 While myriad of spoons cover the ceiling of the former, 1700 naturally polished river rocks were used in the design of the latter, along with cherry blossoms photo images covered with Murano glass beads; circular cross-cuts of bamboo, imbedded in the dark walls like air bubbles in water; and sea urchin “pencils” forming structured overhead décor intertwined with blue Venetian plaster. In healthily-seductive I-Spa, I couldn’t get enough of detox tea, made with fresh ginger, lemon, and honey. Swimming in a pond-like round blue pool, I discovered that the music was playing somewhere at the bottom of it. The spa culture extends here to the unique ihealth initiative, featuring preventative-medicine menus, compiled in collaboration with Adventist Hospital’s nutritionist team. A special a la carte ihealth menu served by Harbourside Restaurant on a teak deck under beach umbrellas, addresses the four prevalent health concerns – diabetes, hypertension, heart disease, and lack of anti-oxidants in the most delicious and easily-digestible way, so to speak. What I enjoyed the most, though, was the Club membership with all the business-meets-pleasure perks, like free internet, daily fresh fruit, and L’Occitane bath amenities. 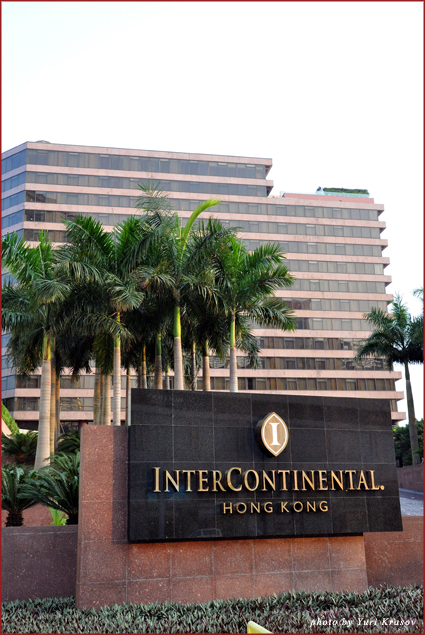 In the InterContinental Hong Kong it is available to any paying guest, not just to those who occupy high-flyer floors, like in other hotels. 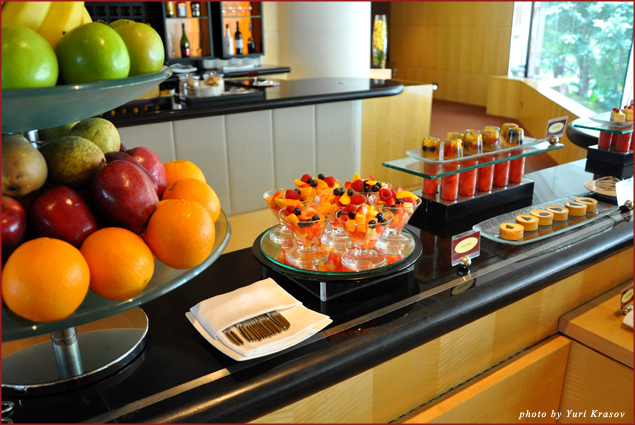 The Club lounge overlooked the glass lobby, Avenue of Stars, and Victoria Harbour, and served East-West breakfasts, afternoon tea with dainty hors d’oeuvres, and evening cocktails. Overcome by the siren song of comfort and luxury, I had to make a conscious decision to step outside into the hot and humid air… Looking through my guidebook, I realized that there was not enough time to see everything I would like to see, so I decided to explore at least the nearby area. I observed the Clock Tower on the waterfront, the only remaining part of the original Kowloon Canton Railway Terminus; the former Marine Police Headquarters building, now called 1881 Heritage, and the former Time Ball Tower. I admired the majestic contemporary trio of Hong Kong Cultural Centre, Hong Kong Space Museum, and Hong Kong Museum of Art, with uniformed school groups lining up by the entrance. 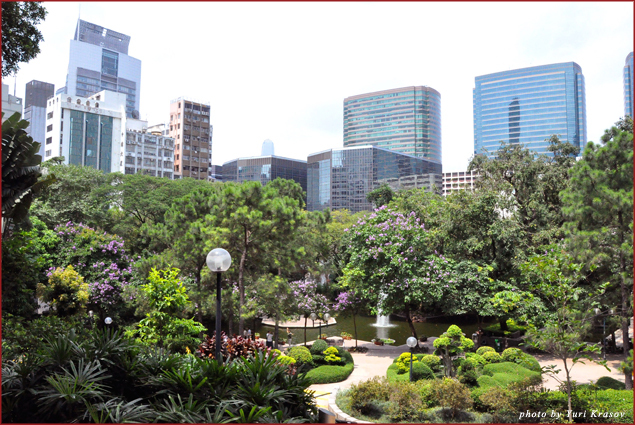 I walked to Kowloon Walled City Park, and wondered through its sculpture garden, aviary, and banyan grove. 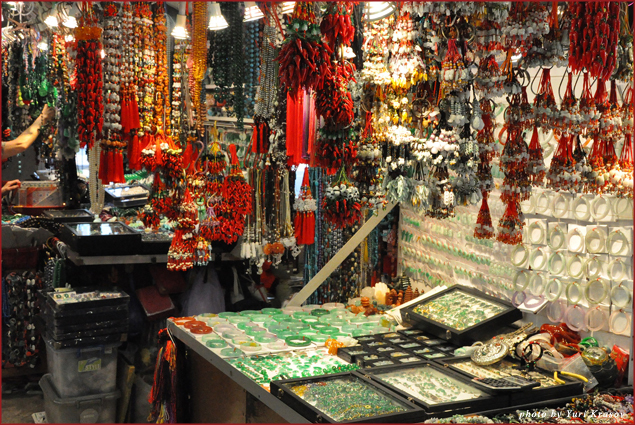 Lastly, I visited the famed Jade Market in Yau Ma Tei, and its 400 stalls overflowing with true and false treasures of the Nine Dragons land. From it, I brought home a little dragon statuette. The mythical animal is supposed to ward off evil and bring good fortune. True or false, it is also supposed to remind me that I can always return to Hong Kong/Kowloon not just for a brief stopover, but for my next vacation. 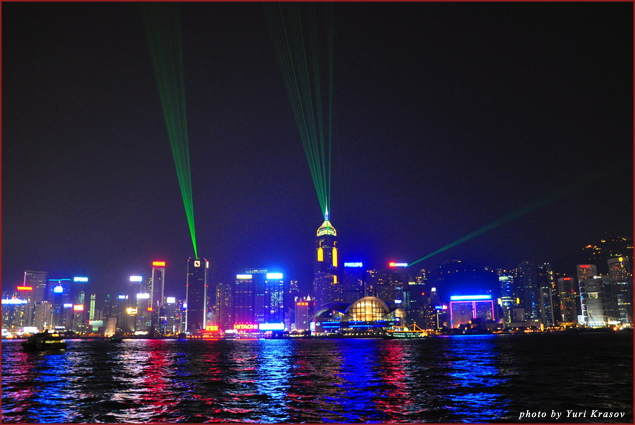 For more information visit Discover Hong Kong and Festive Hong Kong.